The mission was daunting: to engage NASCAR’s fan base beyond the racetrack and win new fans among a generation that seems to watch any screen but television. But the results his team ultimately achieved – hundreds of millions of online views, a Facebook docu-series, a broader audience – earned him a nomination for Content Marketer of the Year. Here’s what we can learn from how he and his team did it. In 2016, NASCAR tapped Evan to head up a content group that included representatives from social media, digital, public relations, brand marketing, entertainment, and other departments. It was a first step to aligning the teams, but problems remained. The group functioned more as a committee than a unified team: Each department still had its own goals. In mid-2017, NASCAR leaders united the teams and put Evan, who reports to NASCAR CMO Jill Gregory, in the driver’s seat. The NASCAR entertainment marketing group in Los Angeles, where Evan started with the company in 2011, also has a dotted line to the content team. These connections help make sure content is integrated across the board. And eight people on the NASCAR Productions team help shoot and edit video content for Evan’s group. The new structure helps the team focus less on narrow job descriptions and more on creating the stories that help build the fan base. The NASCAR content marketing team focuses on stoking the passion of core fans. At the same time, it also works to build relationships with new (often younger) audiences who might otherwise only notice NASCAR during major events like the Daytona 500 or Talladega races. To get both groups engaged year-round, Evan’s team needed to involve the drivers and help them tell great stories. 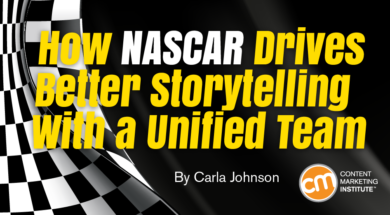 With the new content team, NASCAR has more resources to get engaging stories into the limelight through social media and PR, and to create long-term content strategies, than the individual drivers, team owners, and tracks would on their own. For example, when two-time Daytona 500 winner Dale Earnhardt Jr. told the story on his Dale Jr. Download podcast about how he stole $80 in quarters from his dad’s change jar, NASCAR helped amplify it. It republished the audio as a video using shots from its archives of the younger Dale. In fact, showing a more personal, emotional side of racing is key to the NASCAR team’s strategy. For example, the team produced a video about Wessa Miller, who met seven-time NASCAR champion Dale Earnhardt Sr. through the Make-A-Wish Foundation in 1998. The meeting between Dale Sr. and Wessa, who is paralyzed from the waist down due to spina bifida, happened before that year’s Daytona 500, a race trophy that had always eluded the driver. Wessa gave Dale a good-luck penny. He glued the coin to the dashboard and went on to win the race. The two stayed friends until Earnhardt was killed in a crash during the 2001 Daytona 500. Twenty years after that first meeting, the NASCAR content team sent a reporter and a camera crew to Wessa’s hometown of Phyllis, Ky., to get the in-depth story of what happened in 1998, what’s happened to her since, and what her life is like now. The project brought together multiple groups within the content team, from video production to editorial to social media. The resulting long-form video has more than 14,000 views on YouTube and 20,000 views on NASCAR.com, and the story on NASCAR’s website has been shared on social channels more than 6,000 times, generating more than 60,000 page views. Today, most of the stories Evan’s team produces play out in video and visual formats. Once, NASCAR’s social media posts involved a few lines of text. Now, the team members look at how it can tell a great story through a GIF, a short video, or longer-form video content. They can dive into the story as deeply as makes sense for both content and channel. In March 2018, Evan flipped the switch on a long-awaited NASCAR content studio built for digital and social distribution. The dedicated space – outfitted for easy production of everything from GlFs to livestreaming to long-form video – makes storytelling a breeze. Before the studio, content producers always had to find or borrow space, which meant missed opportunities when they couldn’t find space. Although NASCAR had already built a production studio for TV broadcasting, it wasn’t optimized for the kind of on-the-fly video that lends itself to digital and social channels. Operating the TV equipment requires help from broadcast engineers. The studio also made it possible for the team to create (and sell to Facebook for Facebook Watch) an eight-part docu-series about the first African-American driver in the Daytona 500 since 1969. Behind the Wall: Bubba Wallace, which chronicles the driver’s road to his first Daytona 500 in 2018, has attracted more than 12 million views to date. The team is now working on concepts for a potential second season. The revenue from the sale to Facebook covered NASCAR’s costs, as well as rights and marketing fees. Facebook’s marketing helped the project reach its goal of having as many people see the series as possible. Although Evan has some P&L responsibility and the ultimate goal is to drive revenue, the content team remains a cost center for now. But that doesn’t mean the work isn’t paying other dividends. The content engine fired up by the unified team powered more than 3.8 billion impressions on social channels and nearly one billion video views on digital and social platforms in 2017. The department is on pace to eclipse those numbers in 2018.